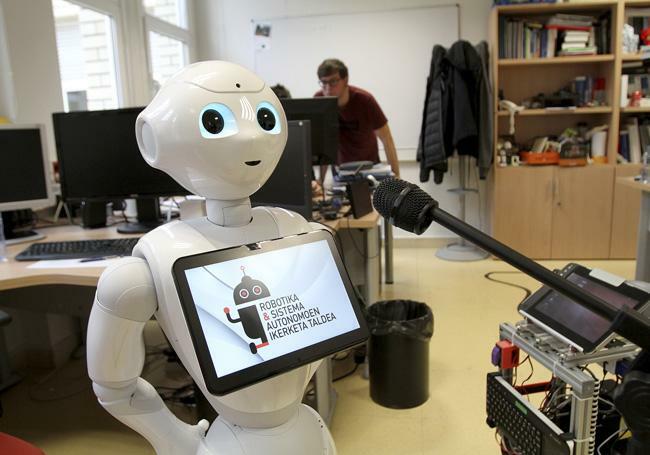 One of the lines of research undertaken by the Robotics and Autonomous Systems (RSAIT) research group at the UPV/EHU's Faculty of Informatics is to develop interaction between humans and machines or robots. Its BertsoBot project is regarded as a major one "in which we get robots to sing verses", said the group's leader Basilio Sierra. The research group is working on numerous aspects in the course of this process: voice signal comprehension, computer vision, browsing, the generating of new musical melodies, etc. Izaro Goienetxea, a researcher in the group and a PhD student, is involved in two areas of research: the automatic generation of music and the automatic classification of music. The researcher says that many methods based on grammars or statistical models have been developed to automatically generate music; but in them "the coherence of the melodies will need to be taken into consideration to be able to generate melodies that are easy to understand. We would need to be sure that certain segments are repeated within the new melodies, not only on the note level but also on other more abstract melodic levels". Even though the work of this researcher had its beginnings in the generation of music, the results have led her to explore ways of classifying music. And she also attaches importance to that classification aspect; indeed "we have more and more music available on the Internet, and one aspect that is becoming important is the possibility of producing automatic classifications of music so that large music collections can be produced," said Goienetxea. In an article published in the PLOS ONE journal, two new methods developed as a result of that research have been presented. Firstly, a musical classification method according to genre is presented. It is based on a new way of representing music and works by grouping together similar bertso tunes. Through it "we analyse a tune, and we say what it is similar to, in other words, which genre we can classify it into," explained Goienetxea. These clusters are also used to automatically generate new melodies in the "style" of the melodies in these clusters. "These new melodies will be similar to the original ones," specified the researcher. "And by including more than one music model, a new melody, a new version, which will be the blending of them, will be generated," added Sierra. To develop her work, the researcher used a corpus or collection comprising bertso tunes. "We are proposing a way in which bertso tunes can be represented and then how these tunes can be classified. We have come up with a method which can then be applied to another kind of corpus, to another kind of music," said Goienetxea. According to the researcher, they have managed to automatically generate new bertso tunes, "but the method also lends itself to music therapy applications, musical composition learning or composing programs, among other things".